The Chipolo is a Bluetooth® item finder that connects with your iPhone®. 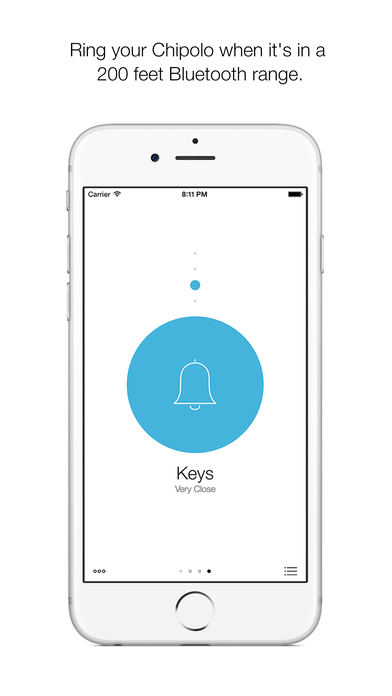 Use the Chipolo to track and find your keys, phone and wallet in seconds. Attach or drop Chipolo to anything you want to track and find fast. Use Chipolo app to ring and find your phone, even if it’s on silent. - Ring your phone: Looking for your phone? Shake any of your Chipolos to make your lost phone ring, even if it’s on silent. - See where you’ve lost it: The app remembers where it last saw your Chipolo, so you can easily find it right where you left it. - The more the merrier: Expand your search using all Chipolo apps in our community. If you misplace your belonging just tap Notify when found button and when another Chipolo app user walk by your lost item with The Chipolo app running, you get an email with a location update. - Sharing is caring: You can track the same Chipolo on up to 4 devices. So now you can share the same Chipolo with your family & friends. - Find your phone from any device: With the Chipolo app your phone or tablet becomes a virtual Chipolo. Just download the app on all of your devices—and use the app on one to find the other. - Control your photos with just a shake: With Chipolo you just have the best remote control for taking photos. Just shake the Chipolo and the App will take a photo. The Chipolo will count down with a sound, so you can be ready to take the best photo. - The app uses Bluetooth Low Energy (BLE) to communicate with your Chipolos. The maximum range is 200 ft. (60 meters) with a line of sight. The range may vary because of external conditions. - The app utilises Location Services to record the last known location of your Chipolos, based on your phone’s geo­-location data. Continued use of GPS or Bluetooth running in the background can dramatically decrease battery life. Before you download, remember that the Chipolo app for iPhone® & iPod touch® ONLY works with the Chipolo. (purchase required). Chipolo™ - Nothing is lost.